Schweizer Dipple Inc. (SDI) is a full-service Mechanical Contractor specializing in Industrial Process Piping, Fire Protection Systems, Sheet Metal, Heating and Air Conditioning service. SDI has a State-of-the-Art 25,000 sq. ft. Fabrication Shop and office. Our Fabrication Shop is equipped with the latest equipment in order to pre-fabricate piping systems and sheet metal to minimize field work, which helps our customers with scheduling and budgeting. SDI also holds maintenance contracts with many companies in the Northeast Ohio area and can accommodate any service or emergency work. We can handle any size project from daily maintenance and outage work to major expansions and new construction. 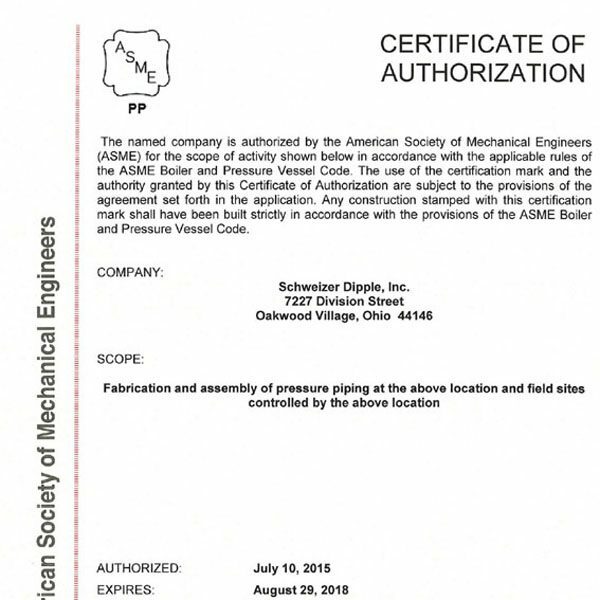 Schweizer Dipple Inc. has certifications from the American Society of Mechanical Engineers (ASME) and The National Board of Boiler & Pressure Vessel Inspectors. 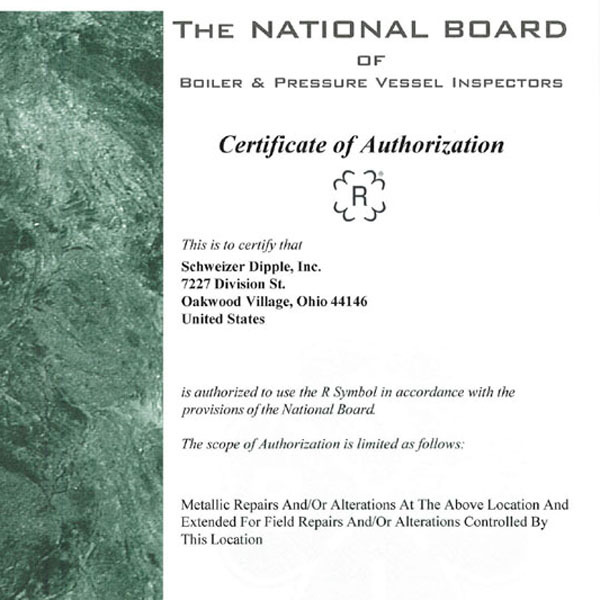 Both certifications are valid through August 29, 2018. A project manager will direct all activities and a field construction team of veteran superintendents, supervisors and technicians assures constant accountability and reliability. Once the job starts we continually compare actual costs to our forecasts to keep the job on budget. Our professional affiliations add to our strength and offer many advantages, not the least of which is a sharing of knowledge and experience. We bring personal pride and creative enthusiasm to each new assignment so that we are ready to meet all challenges.